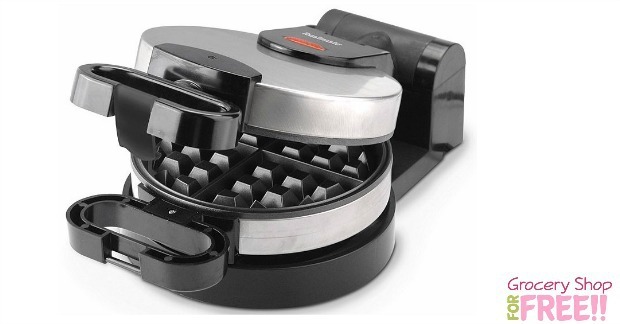 Toastmaster Flip Over Waffle Maker Just $9.97! Down From $40! You are here: Home / Great Deals / Toastmaster Flip Over Waffle Maker Just $9.97! Down From $40! You can grab this Toastmaster Flip Over Waffle Maker for just $9.97! Down From $40! You can also choose to pick it up in store for FREE shipping! This would make a nice housewarming gift, or gift for a college student! A fabulous meal is minutes away with the Toastmaster Flip Over Wafflemaker. A convenient flip over design ensures even heating for the perfect waffle each time while the ready lights lets you know when they’re done. Non-stick plates means cleaning this wafflemaker is a breeze.